Ferriss said that he spent three years interviewing over 200 people, from doctors to athletes to black-market drug salesmen, in preparing the book. The book advocates the 'Slow-carb Diet', which is characterised around three main points: eat a very simple set of meals repeatedly, focus on 'slow carbs', and allow one 'cheat day' a week when all foods are allowed. The diet involves the elimination of starches and anything sweet (including fruit and all artificial sweeteners) and a strong preference for lean protein and a few specific vegetables. The Dietary Guidelines for Americans do not specifically address the 'Slow-carb diet'. A review of The 4-Hour Body in WebMD was skeptical of the diet, quoting Barry Sears (creator of the Zone diet): “Skip the 4-hour body and opt for a 24-hour-365-day-a-year body, because you need a plan that makes sense that you can live with.” In the same article, Michael Aziz (creator of the Perfect 10 Diet) claims the cheat day is "dangerous". On the other hand, the review praises the avoidance of "white" carbohydrates and the recommendation to eat the same few meals repeatedly. The Harvard Business Review quoted Dr. Tieraona Low Dog: "many people will lose weight if they follow it, though I don’t think that the diet is capable of all the claims in the book." Low Dog also warns about "the very limited number of vegetables to choose from," though in fact apart from starchy vegetables such as potatoes the slow-carb diet allows free choice in vegetables. U.S. News quoted Scott Kahan (codirector of the George Washington University Weight Management Program) describing it "as another cockamamie fad diet" and expressing doubts about its sustainability. The New York Times review stated "it's among the craziest, most breathless things I’ve ever read, and I’ve read Klaus Kinski, Dan Brown and Snooki." Ferriss was criticized for dispensing medical advice while not being a certified doctor or dietician. As part of the press for the book, Ferriss appeared as a guest on The Dr. Oz Show and ABC's The View. The 4-Hour Body debuted at #1 on the New York Times Bestseller List and spent 3 weeks in the top 3. It peaked at #4 on both the Wall Street Journal and USA Today's lists, and was one of Amazon.com's top 5 bestselling books for December 2010 and January 2011. ^ a b Cahalan, Susannah (12 December 2010). "Review: The 4-hour body". New York Post. ^ a b Samuel, Alexandra (10 March 2011). "The 4-Hour Body? Not So Much". Harvard Business Review. ^ Hiatt, Kurtis. "'The 4-Hour Body'—Does It Deliver Results?". US News & World Report. ^ a b Garner, Dwight. New! Improved! Shape Up Your Life! The New York Times. January 6, 2011. ^ "Four Hours to Your Perfect Body, Pt. 1". Dr. Oz. ^ "Tim Ferriss and The 4-Hour Body on "The View"". February 15, 2011. ^ Boog, Jason. How Timothy Ferriss Hit the Amazon Bestseller List GalleyCat. December 20, 2010. ^ Best Sellers: Hardcover Advice & Misc The New York Times. January 2, 2011. ^ Best Sellers: Hardcover Advice & Misc The New York Times. January 16, 2011. ^ Best-Selling Books Week Ended Jan. 9 The Wall Street Journal. 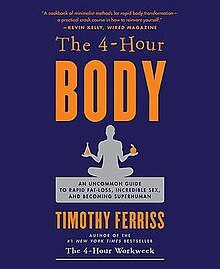 ^ Best-Selling Books Database: The 4-Hour Body USA Today. ^ Bestsellers in Books for the Week of December 27, 2010 Amazon.com. ^ Bestsellers in Books for January 2011 Amazon.com. This page was last edited on 29 December 2018, at 04:50 (UTC).